Largely unchanged since its initial passage in 1819,1 the Illinois Fence Act provides that adjoining landowners “. . . shall make and maintain a just proportion of the division fence between them[. ]”.2 When the legislature drafted the statute in the early 1800s, land use patterns in Illinois looked quite different than today. 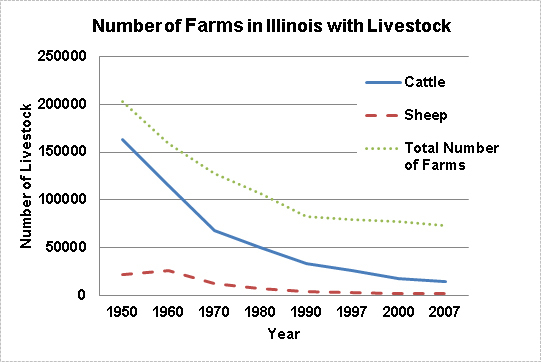 Specifically, more landowners had cattle and sheep roaming their land.3 Starting in 1950, the number of farms in Illinois with livestock grazing has declined, with dramatic reductions in the 1960s and 1970s. As shown in the chart below, this trend continues. Illinois currently has approximately 76,000 farms, of which only twenty-three percent–17,480–graze beef cows.4 This is down from approximately eighty percent in 1950, and appears to be the new normal with respect to agricultural land use. In addition to dramatically fewer farms with livestock, individual farms are increasing in acreage. As a result, division fences are larger and potentially more expensive. More importantly, as the vast majority of farms no longer graze livestock, most farmers receive little, if any, benefit for bearing the cost of maintaining a division fence under the current statutory regime. The livestock owner, who needs the fence to protect herself from liability exposure arising from escaped livestock, receives a non-reciprocal benefit at the expense of the non-livestock owning neighbor. To eliminate, or at least minimize non-reciprocal benefits, stakeholders should reexamine the current Illinois Fence Act in light of the state’s changed agricultural practices. An accompanying full-length article on the farmdoc website (click here to access) provides more background and analysis on this subject, describing fence law models applied in major agricultural producing states, examining the current Illinois statute and case law, and recommending, based on economic efficiency principles, revising the Illinois Fence Act to reflect modern land use practices based on the equitable cost-sharing model adopted by the Missouri legislature in 2001. 1 Jeffrey A. Mollet, When Bad Fences Make Litigious Neighbors: The Illinois Fence Act, 89 ILL. B.J. 429, 429 (2001). 3 Illinois Department of Agriculture, Historic View/Livestock, Dairy & Poultry, http://www.agr.state.il.us/about/history/histlive.html (last visited Nov. 26, 2012). 4 Illinois Department of Agriculture, Historic View/Livestock, Dairy & Poultry, http://www.agr.state.il.us/about/history/histlive.html (last visited Nov. 26, 2012).